Bruce Frederick Joseph Springsteen (September 23, 1949 - ) is an American songwriter, singer, and guitarist. He is widely known for his brand of "heartland rock," infused with pop hooks, poetic lyrics, and Americana sentiments centered around his native New Jersey. Often recorded with the E Street Band, Springsteen's most famous albums, Born to Run and Born in the U.S.A., epitomize his penchant for finding grandeur in the struggles of daily life. He has sold over 65 million albums in the US alone. Springsteen's eloquence in expressing ordinary, everyday problems has earned him numerous accoloades, including 18 Grammy Awards and an Academy Award, along with a notoriously devoted global fan base. His recordings have tended to alternate between commercially accessible rock albums and somber folk-oriented works. Much of his iconic status stems from the concerts and marathon shows in which he and his band present intense ballads, rousing anthems, and party songs, among which Springsteen intersperses long whimsical or emotional stories. Springsteen has long had the nickname "The Boss." He was inducted both into the Rock and Roll Hall of Fame and the Songwriters Hall of Fame in 1999. Bruce Springsteen was born at Monmouth Medical Center in Long Branch, New Jersey. He spent his childhood and high school years in Freehold. Raised a Roman Catholic, Springsteen attended the St. Rose of Lima parochial school in Freehold Borough, where he was often at odds with both the nuns and other students. Cities such as Asbury Park, New Jersey inspired the themes of ordinary life in Bruce Springsteen's music. In ninth grade he transferred to the public Freehold Regional High School, but did not fit in there either. Springsteen was well known for running the streets, petty crime, and a drug habit. Springsteen's reputation as a troublesome youth is reflected in the Traveling Wilbury's Tweeter and the Monkeyman lyric, "In Jersey everything's legal, as long as you don't get caught." After completing high school he briefly attended Ocean County College. 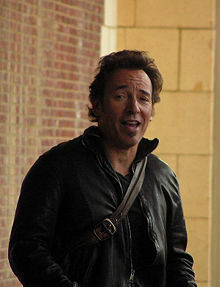 Springsteen had been inspired to take up music at the age of seven after seeing Elvis Presley on The Ed Sullivan Show. At 13, he bought his first guitar for 18 dollars. Later, his mother took out a loan to buy the 16-year-old Springsteen a 60-dollar Kent guitar, an event he later memorialized in his song "The Wish." Guitarist and E Street Band member Steven Van Zandt. In 1965, he became the lead guitarist and later lead vocalist of The Castiles. The group recorded two original songs at a public recording studio in Brick Township, New Jersey and played a variety of venues, including Cafe Wha? in Greenwich Village. From 1969 through early 1971, Springsteen performed around New Jersey with guitarist Steve Van Zandt, organist Danny Federici, drummer Vini Lopez, and later bassist Vinnie Roslin, in a band called Child, subsequently renamed Steel Mill. They went on to play the mid-Atlantic college circuit and also briefly toured in California. During this time, Springsteen also performed at small clubs in Asbury Park and along the Jersey Shore, where he gathered a dedicated following. Other acts followed over the next two years, as Springsteen sought to shape a unique and genuine musical and songwriting style. These included Dr. Zoom & the Sonic Boom (early to mid 1971), Sundance Blues Band (mid 1971), and The Bruce Springsteen Band (mid 1971 to mid 1972). With the addition of pianist David Sancious, the core of what would later become the E Street Band was formed. Sax player Clarence Clemmons would join the band in 1973. The group explored blues, R&B, jazz, early rock and roll, soul, and gospel. Drawing on his extensive local appeal, Springsteen routinely sold out consecutive nights in major New Jersey and Philadelphia venues with song lists that varied significantly from one night to the next. He also made many surprise appearances at The Stone Pony and other shore nightclubs over the years, becoming the foremost exponent of the Jersey Shore sound. Springsteen's prolific songwriting ability brought his skill to the attention of new managers Mike Appel and Jim Cretecos. Legendary Columbia Records talent scout John Hammond auditioned Springsteen in May 1972. With the help of Hammond, Springsteen signed a record deal with Columbia Records. His debut album, Greetings from Asbury Park, N.J., released in January 1973, established him as a critical favorite, although sales were slow. In September 1973 his second album, The Wild, the Innocent & the E Street Shuffle was released, again to critical acclaim but no commercial success. Springsteen's songs became grander in form and scope, with the E Street Band providing a less folksy, more R&B sound and the lyrics often romanticizing teenage street life. The songs "4th of July, Asbury Park (Sandy)" and "Incident on 57th Street" would become fan favorites, and the long, rousing "Rosalita (Come Out Tonight)" would rank among Springsteen's most beloved concert numbers. 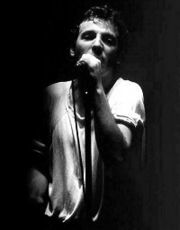 On August 13, 1975, Springsteen and the E Street Band began a five-night, ten-show stand at New York's Bottom Line club. The show attracted major media attention and was broadcast live on WNEW-FM, convincing many skeptics that Springsteen was for real. With the release of the album Born to Run on August 25, 1975, Springsteen finally found success. While the album produced no big hit singles, "Born to Run," would become Springsteen's signature song and would go on to be listed at number 21 on Rolling Stone magazine's list of the 500 Greatest Songs of All Time. The album established him as a sincere and dynamic rock and roll personality who spoke for and in the voice of a large part of the rock audience. To cap off the triumph, Springsteen appeared on the covers of both Time and Newsweek in the same week, on October 27 of that year. In 1977, Springsteen returned to the studio and produced Darkness on the Edge of Town (1978). Musically, this album was a turning point of Springsteen's career. The songs were leaner and more carefully drawn, beginning to reflect Springsteen's growing intellectual and political awareness. Tracks such as "Badlands" and "The Promised Land" became concert staples for decades to come, while "Prove It All Night" received a significant amount of radio airplay, reaching number 33 on the Billboard Hot 100. Springsteen's performances on the cross-country Darkness Tour to promote the album would become legendary. Springsteen during The River Tour in Norway, 1981. By the late 70s, Springsteen had earned a reputation in the pop world as a songwriter whose material could provide hits not only for himself but for other bands as well. Manfred Mann's Earth Band achieved a U.S. number-one pop hit with a heavily rearranged version of "Blinded by the Light" in early 1977. Patti Smith reached number 13 with her take on "Because the Night," which she co-wrote with Springsteen in 1978, while The Pointer Sisters hit number two in 1979 with Springsteen's unreleased "Fire." In September 1979, Springsteen and the E Street Band joined the Musicians United for Safe Energy anti-nuclear power collective at Madison Square Garden for two nights, premiering two songs from his upcoming album. The subsequent No Nukes live album, as well as the following summer's No Nukes documentary film, represented the first official recordings and filming of Springsteen's fabled live act, as well as Springsteen's first tentative foray into political activism. Springsteen continued to consolidate his thematic focus on working-class life with the 20-song double album The River in 1980. This album yielded his first hit Top-Ten single, "Hungry Heart." The album sold well, and a long tour in 1980 and 1981 followed, featuring Springsteen's first extended performances in Europe, and ending with a series of multi-night arena stands in major cities in the U.S. Following The River, Springsteen produced the stark, solo acoustic Nebraska in 1982. Springsteen was reportedly in a depressed state when he wrote this material, and the result was a brutal depiction of American life. While Nebraska did not sell especially well, it garnered widespread critical praise, including being named "Album of the Year" by critics at Rolling Stone magazine. It helped inspire the musical genre known as lo-fi music, becoming a cult favorite among indie-rockers. Born in the U.S.A. (1984) is Springsteen's best known album, selling a phenomenal 15 million copies in the U.S. alone. One of the best-selling albums of all time, it featured seven singles that hit the the Top Ten. A massively successful world tour followed its release. The title track was a bitter commentary on the treatment of Vietnam veterans, some of whom were Springsteen's friends and bandmates. "Dancing in the Dark" was the biggest of seven hit singles from Born in the U.S.A., peaking at number two on the Billboard music charts. The music video for the song featured a young Courteney Cox dancing on stage with Springsteen, an appearance which helped kickstart the actress's career. A number of the videos for the album were made by noted film directors Brian De Palma or John Sayles. The Born in the U.S.A. period represented the height of Springsteen's visibility in popular culture. Live/1975–85, a five-record box set (also released on three cassettes or three CDs), was released near the end of 1986 and also became a huge success, selling 13 million units in the U.S. and becoming the first box set to debut at number one on the U.S. album charts. Is was one of the best selling live albums of all time. After this commercial peak, Springsteen released the much more sedate and contemplative Tunnel of Love (1987), a mature reflection on the many faces of love found, lost and squandered, which only selectively used the E Street Band. In 1992, after risking charges of "going Hollywood" by moving to Los Angeles and working with session musicians, Springsteen released two albums at once. Human Touch and Lucky Town were more introspective than any of his previous work. Already the recipient of several Grammys, Springsteen won an Academy Award in 1994 for his song "Streets of Philadelphia," which appeared in the soundtrack to the film Philadelphia. In 1995, after temporarily re-organizing the E Street Band for a few new songs included in his first Greatest Hits album, Springsteen released his second (mostly) solo-guitar album, The Ghost of Tom Joad. This album was less well-received than the similar Nebraska, due to its twangy vocals and the overtly political nature of most of the songs. During the lengthy, small-venue solo tour that followed, Springsteen frequently had to remind his audiences to be quiet during the performances. In 1998, Springsteen released a four-disc box set of out-takes from sessions with the E Street Band, entitled Tracks. Springsteen and the band officially came together again in 1999 and went on the extensive Reunion Tour, lasting over a year. Highlights included a record sold-out, 15-show run at Continental Airlines Arena in East Rutherford, New Jersey to kick off the American leg of the tour. In 1999, Springsteen was inducted into both the Rock and Roll Hall of Fame and the Songwriters Hall of Fame. 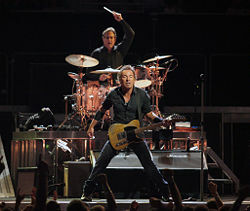 Springsteen's Reunion Tour with the E Street Band ended with a triumphant ten-night, sold-out engagement at New York City's Madison Square Garden in mid-2000. The final shows at Madison Square Garden were recorded and resulted in an HBO Concert, with corresponding DVD and album releases as Bruce Springsteen & the E Street Band: Live in New York City. In 2002, Springsteen released his first studio effort with the full band in 18 years, The Rising, produced by Brendan O'Brien. The album, mostly a reflection on the September 11 attacks, was a critical and popular success. The title track gained airplay in several radio formats, and the record became Springsteen's best-selling album of new material in 15 years. The Rising Tour barnstormed through a series of single-night arena stands in the U.S. and Europe to promote the album in 2002, then returned for large-scale, multiple-night stadium shows in 2003. 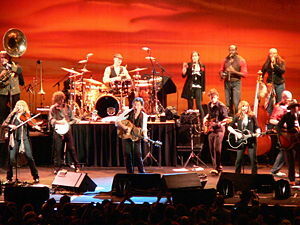 Devils & Dust, released on April 26, 2005, was recorded without the E Street Band, as a low-key, mostly acoustic album. The album entered the album charts at number one in the United States and at number nine in other countries. In November 2005, Sirius Satellite Radio started a 24-hour, seven-day-a-week radio station on Channel 10 called "E Street Radio." This channel featured commercial-free Bruce Springsteen music, including rare tracks, interviews, and concerts of Springsteen and the E Street Band recorded throughout their career. Springsteen with presidential candidate and Mrs. Barack Obama in 2008. In April 2006, Springsteen released We Shall Overcome: The Seeger Sessions, an American roots music project focused around a folk-sound treatment of 15 songs popularized by the left-wing musical activism of Pete Seeger. It was recorded in only three one-day sessions. A new tour began the same month, featuring the 18-strong ensemble of musicians dubbed the Seeger Sessions Band, later shortened to the Sessions Band. The tour proved very popular in Europe, although a number of U.S. shows suffered from sparse attendance. Magic, was released on October 2, 2007. Recorded with the E Street Band, it featured ten new Springsteen songs plus "Long Walk Home," performed with the Sessions band. Magic debuted at number one in Ireland and the UK. Greatest Hits reentered the Irish charts at number 57, and Live in Dublin almost cracked the top 20 in Norway again. Ultimately, Magic had sold nearly 2 million copies by the end of 2007. Meanwhile, Sirius Satellite Radio restarted "E Street Radio" in September 2007 in anticipation of Magic. In April 2008, Springsteen announced his endorsement of U.S. Senator Barack Obama in his 2008 presidential campaign. He was scheduled to release a new album, Working on a Dream, on On January 27, 2009 and to star in the halftime show at Super Bowl XLIII on February 1, 2009. He won both an Academy Award for Best Song" for Streets of Philadelphia" in 1993 and an Emmy Award for the HBO special Bruce Springsteen & the E Street Band: Live In New York City. In 1999, Springsteen was inducted both into the Rock and Roll Hall of Fame and the Songwriters Hall of Fame. His song, "Born to Run," was named "The unofficial youth anthem of New Jersey" by the New Jersey state legislature. (Ironically, the song is about leaving the state.) He is ranked number 23 on Rolling Stone Magazine's list of the 100 Greatest Artists of All Time (2004). Alterman, Eric. It Ain't No Sin To Be Glad You're Alive: The Promise of Bruce Springsteen. New York: Little Brown, 1999. ISBN 0316038857. Coles, Robert. Bruce Springsteen's America: The People Listening, a Poet Singing. New York: Random House, 2005. ISBN 0375505598. Cross, Charles R. Backstreets: Springsteen: The Man and His Music. New York: Harmony Books, 1992. ISBN 051758929X . Cullen, Jim. Born in the U.S.A.: Bruce Springsteen and the American Tradition. Middletown, CN: Wesleyan University Press, 2005. ISBN 0819567612. Eliot, Marc, with Appel, Mike. Down Thunder Road. New York: Simon & Schuster, 1992. ISBN 0671868985. Guterman, Jimmy. Runaway American Dream: Listening to Bruce Springsteen. Cambridge: Mass. Da Capo Press, 2005. ISBN 0306813971. Hilburn, Robert. Springsteen. New York: Rolling Stone Press, 1985. ISBN 0684184567. Marsh, Dave. Bruce Springsteen: Two Hearts: The Definitive Biography, 1972-2003. New York: Routledge, 2003. ISBN 041596928X. Wolff, Daniel. 4th of July, Asbury Park: A History of the Promised Land. London: Bloomsbury, 2005. ISBN 1582345090. This page was last modified on 6 July 2016, at 22:52.